Giant portraits of Mr Berdymukhamedov hang from every building and similar images adorn their luxurious interiors. Soldiers guard the entrance and beach at one hotel, the Watanchi (photo), which is owned by the Defence Ministry. The former Soviet republic of Turkmenistan is trying to create the world’s next tourist hotspot near a city named after its eccentric former dictator. Six hotels along a stretch of sandy beaches by the Caspian Sea are the first elements of a USD 5 billion ( GBP 3 billion) project to turn this secretive country into Central Asia’s Costa del Sol. Turkmenistan was all but closed to foreigners under the late Saparmurat Niyazov, the self-styled Turkmenbashi or ''Father of the Turkmen'', who ran one of the world’s most repressive regimes. 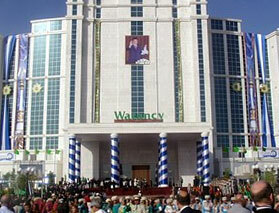 His successor, President Gurbanguly Berdymukhamedov, has decreed that his country should become a tourist magnet. He calls the proposed Avaza resort outside the city of Turkmenbashi a Klondike of tourist gold that will put Turkmenistan on the map as a rival to Spain, Turkey and Egypt. It is more desert mirage than dream destination at present. Visitors arriving at Turkmenbashi’s rundown airport drive along rutted roads past the flares of the city’s large oil refinery to reach the white marble hotels set in a barren landscape. Giant portraits of Mr Berdymukhamedov hang from every building and similar images adorn their luxurious interiors. Soldiers guard the entrance and beach at one hotel, the Watanchi, which is owned by the Defence Ministry. There are grand — sceptics say grandiose — visions of creating a tourist paradise on the shores of the Caspian, tapping Turkmenistan’s earnings from the world’s fourth-largest gas reserves. Workmen are digging a channel for an artificial river that will run for almost five miles through the resort. Sixty hotels, including one on a man-made island in the Caspian, are planned along a ten-mile stretch of coastline, as well as shopping malls, entertainment centres, a 10,000-seat sports stadium and an indoor skiing centre in a resort where temperatures can hit 50C in summer. ''We will be no worse than Antalya [the Turkish tourist city] in a few years,'' said Gaip Klichev, the Watanchi manager, pointing to stunning views beyond sandy white beaches. ''We are sure that lots of people will want to come to Turkmenistan.'' A new international airport is being built and the regime is promising to simplify visas. Cost is another attraction — rooms comparable to four-star hotels in Europe cost USD 50 to 75 (GBP 30-45) a night, full board.